The horror sub-genre of “killer mirrors” has been done over and over again to the point of boredom. It had come to a point where either a good original screenwriter or a talented director was needed to offer something original. Otherwise, the evil mirrors risked killing themselves. Oculus was received in the United States as one of the most original and scariest horror films in years. So, with the hype raise on this side of the Atlantic, horror fans wondered just how much of this was real and how much was marketing. What’s It About? Eleven years ago, tragedy struck the family of teenage siblings Tim and Kaylie Russell. Their parents were brutally murdered and Tim was charged with their deaths and convicted. Now, Tim is released from a mental institution and just wants to move on with his life; but his sister Kaylie wants to clear Tim’s name. She’s convinced the Lasser Glass, an antique mirror in their childhood home, unleashed an evil supernatural force that killed their parents. After researching the history of the mirror for years, she manages to get it back to perform an experiment which she plans to record with different cameras. Verdict? In case you were wondering, no, Oculus doesn’t play the found footage card despite the premise of having the protagonist recording the experiment on camera. Co-writer/director Mike Flanagan, who shot an award-winning short on which this feature is based, knew he couldn’t just go and make another “killer mirror” flick. It they were going to make a feature about an evil supernatural mirror, first they needed to find a clever, original way to do it. He was not going to make just a typical horror movie. In order to do so, he focused on two things he thought could kill the story if not done right: first and foremost, the characters needed to have flaws and personalities that made the audience care about them. That’s the problem when it comes to most horror films: you simply don’t give a damn about who dies or who lives. Yes, a death can be cool and original, one scene could even make you jump, but if you don’t care about the characters, the audience will never be emotionally hooked and suffer for the protagonists. Flanagan, both from the screenplay and the directing point of view, indulges this audience need. The characters have flaws, dramatic arcs, goals and personalities perfectly drawn on the pages of the script and these come to life thanks some very good performances. Battlestar Galactica’s Katee Sackhoff and Doctor Who’s Karen Gillan are the two female leads as mother and sister in different timelines. Although it is Annalise Basso who most surprises with such a strong presence on the screen as a young Kaylie. Second, but not least, Flanagan finds a clever way of telling the story. The story of how Kylie and Tim lost their parents is inter-cut with the contemporary events of the two siblings throughout the whole film. Flanagan gives the audience enough time to get used to the continuous jumps back and forth in time. By the third act, the viewer’s eye is so accustomed that the director cuts from one time line to the other almost shot to shot, even merging both stories at some points. A clever, original way to tell a horror film that will leave you happily exhausted by the end. The downside is that, as a horror movie, it is not as scary as fans might expect. It is tense, gripping and surprising, yet not chills-will-run-down-your-spine kind of scary. 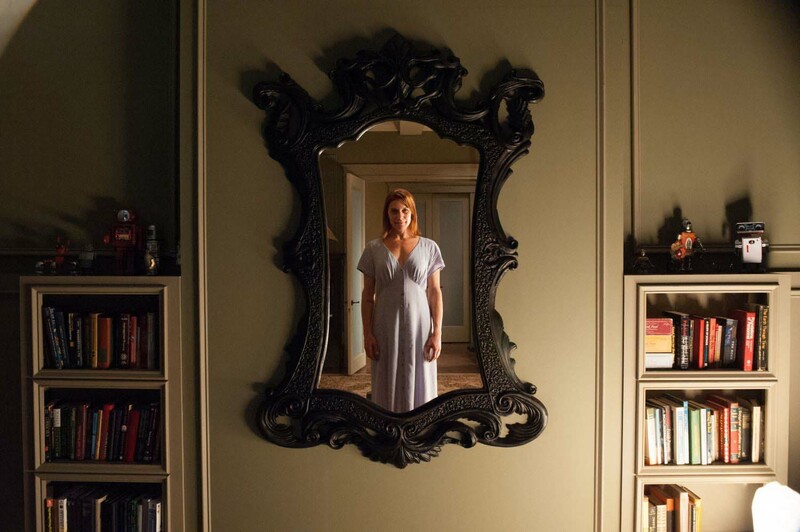 Final words: Oculus does not reinvent the horror wheel, but it certainly knows how to revitalize the genre, pleasing both audiences and critics alike. Oculus is out on Blu-ray and DVD on 20 October 2014.